A trial of new scanners at Heathrow Airport could mean passengers will not have to remove liquids from their hand luggage. The Department for Transport said a "small number" of trials was set to last between six and 12 months. A DfT spokesperson said: "The UK has some of the strictest security measures in the world, and we are leading the way in using new technology to improve security screening and provide a better experience for passengers. "If successful, this could lead in future to passengers no longer needing to remove items from hand luggage for screening." The DfT added: "We continue to work closely with our international counterparts to harness the latest advances in technology." The new computerised tomography (CT) scanners have also reportedly been tested at Amsterdam's Schiphol airport and John F Kennedy airport in New York. It comes five years after the European Commission said it hoped the restrictions across Europe could be ended through "technological screening". The current rules specify that containers of liquid must hold no more than 100ml and fit in a small transparent, resealable plastic bag, which needs to be removed from hand luggage during pre-flight security checks. They were introduced amid fears transatlantic flights could be brought down by terrorists hiding liquid explosives in small drink bottles. But it has resulted in longer security checks, and has coincided with the rise in travel on low-cost airlines where many passengers only carry hand luggage. Security policy for all UK airports is set by the DfT. The DfT said the new technology allows baggage screeners "to use 3D imagery to look at objects from all angles". It said while the the trials take place, the rules remain the same and passengers should expect to remove items if requested during the security screening purposes. A Heathrow spokeswoman confirmed the airport was "looking at new technologies that can both improve the passenger experience and strengthen our security". 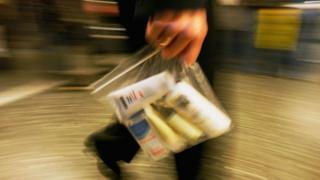 What are the rules on travelling with breast milk?